With only a few days in Bordeaux, what to visit to get a good balanced AUTHENTIC feel of one of the world’s top wine regions. From someone who has lived off and on in Bordeaux since 1989 as a wine professional who likes the simplicity of enjoying wine in and around my home-town! 5. Get off the usual routes and ramble behind Château Ausone (small road that passes between its vines) in St Emilion. 8. Stroll on the river bank of the Gironde Estuary behind Château Beychevelle (St Julien) with fishing huts. The châteaux’s best front view are all pointing to the river for the benefit of the passing trade! 9. Take the route de labarde road passing through Macau and then the Route de Châteaux D2 which winds its way up infront of some of the world’s most famous châteaux in the Médoc. 10. For a authentic old-fashioned taste of French country cooking with seasonal ingredients and the chance to rub elbows with maitre du chai from Médoc’s most well-known chateau, lunch at the institution ‘Le Lion d’Or’ (prepare yourself for the outspoken chef Barbier) in the village of Arcins (not far from Moulis) – on the D2 on the way to Margaux (Médoc). 11. The best restaurant in the Médoc is unboubtedly Les Bons Temps in Cussac Fort Médoc. Chef Damien and his japanese wife make an efficient team and serve delicious dishes with a slight asian twist to french classics. 13. CIVB wine bar for a chance to sample a range of 20 different appellations in the city’s Maison du Vin (opposite the tourist information). Perfect for wine apertifs throughout the day from 11am and until 10.00pm. Range changes regularly. Closed sundays and bank holidays. 14. La Brasserie Bordelaise is a must, regional food served with modern edge, great young atmosphere. Very wine focussed. Wines presented by oenologist consultant, original approach! What if you are owner and make the wine yourself?? 15. Sunday market on Bordeaux’s quays called ‘Marché Colbert’ an old steel war boat that used to be located here blocking a lot of resident’s views of the beautiful Garonne River (it was towed away some three or so years ago in response to public’s cry to “Sink the Colbert!”). Wonderful open-air food market and a chance to buy a bottle of wine and picnic along the river or (more civilised) enjoy oysters and white wine (other food stalls available too and often live music). 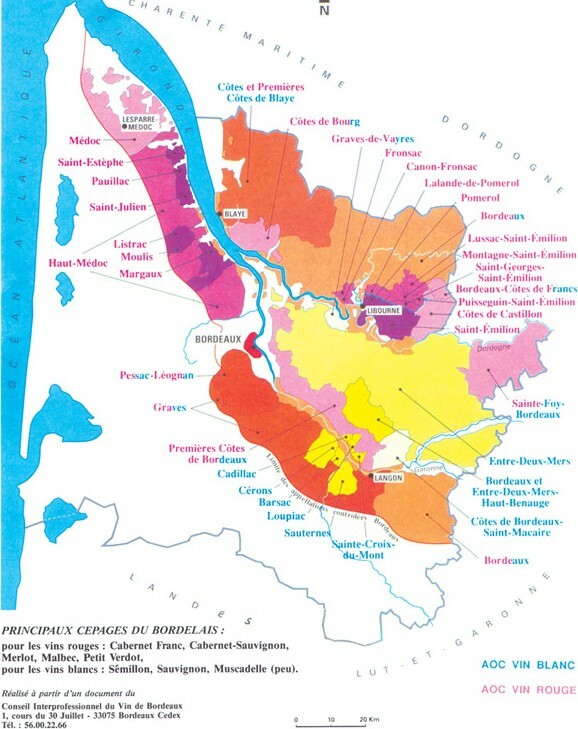 Not very clear map but one can make out the right bank of the garonne (the darkest purple is St Emilion) and the left bank (Medoc) in purple! Pauillac: Château Pontet Canet Grand Cru Classé – the only biodynamic classified property. Visit of vineyards in golf cart. Château Siaurac – wonderful property set in 15 hectares of parkland. 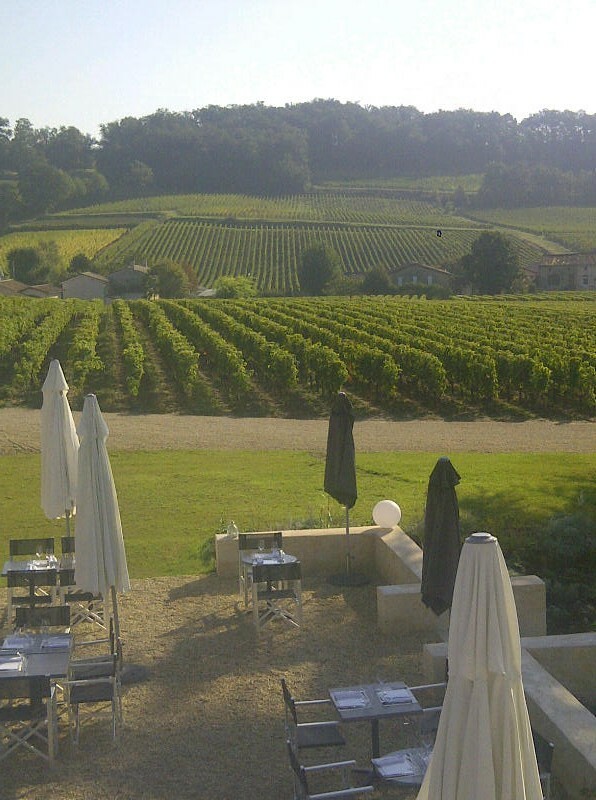 Visit the actual château and taste the family’s other two wines a very fine St Emilion and Pomerol neighbour to Petrus.